Beautifully engraved certificate from the Wallkill Valley Railway Company issued in 1868. This historic document was printed by Henry Sierbert & Bros, N.Y. and has an ornate border around it with a vignette of a train passing with men working on the side. This item has been trimmed on the bottom for cancellation. The Wallkill Valley Railway Company was organized on April 26, 1866, and road opened in the same year. The road was sold on June 26, 1877, and on July 2, 1877, the company was reorganized, under foreclosure proceedings, as The Wallkill Valley Railroad Company, under chapter 430, laws of 1874, of the State of New York, as amended by chapter 446, laws of 1876. 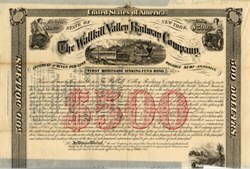 Under date of April 11, 1899, the railroad and other property of the company were leased to The New York Central and Hudson River Railroad Company, from May 1, 1899, for the term of its corporate existence, the consideration being, in substance, the interest on all outstanding bonds and obligations, including interest at three and one-half per cent per annum on the first and second mortgage bonds together with a dividend of three and one-half per cent per annum on the outstanding capital stock of the company. In 1913 all its bonds were cancelled.